When department store shelves are filled with toys encasing flashy lights, battery operated noise, magic plastic and squishy silicone, it’s refreshing to see there’s still a spot in Santa’s sleigh for the timelessness of beautiful wooden toys. From small wooden toys to serious big ticket items, we have them all in our Gift Guide! The perfect gift to partner a tea set or toy kitchen, Iconic Bickies are sure to be a pretend play hit. The set includes ten cleverly made iconic Aussie biscuits including popular favourites Tim Tams and Tic Toc, all nestled in a groovy biscuit tin of course! A tin of bickies that will last longer than any other biscuits in your home, you can pick yours up for $35 at Make Me Iconic. Even the littlest of ladies love to copy mum so it’s only natural that they’d want their own dresser for all their treasures! Little girls can stash their jewellery collection, hair clips and anything else they desire in this super cute white timber Madeline Play Vanity. Featuring a stunning three panel mirror and solid surface top for displaying her most special belongings. The Madeline Play Vanity is priced $299 from the good folk at Pottery Barn Kids! Beep! Beep! A hot favourite for small hands, we think there will be plenty of hustle and bustle traffic action this Christmas with this gorgeous Wood Vehicle and Traffic Sign Set. 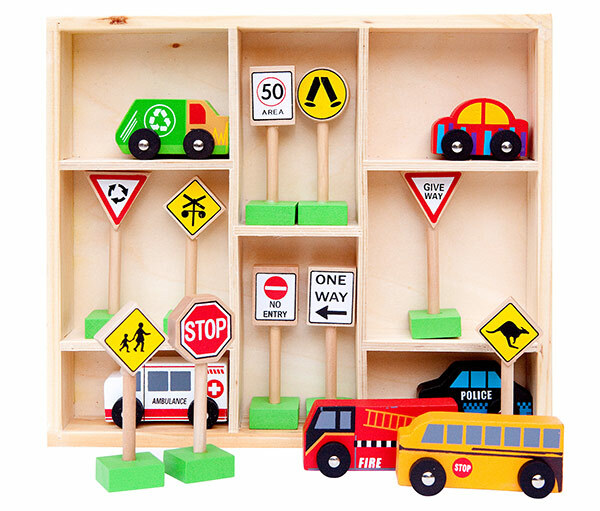 An awesome toy for children to learn about and recognise road traffic signs, the set comes complete with six vehicles and ten road signs, all beautifully painted with child safe paints and presented in a wooden box. An all Australian-made box of hustle and bustle road action costs just $19.99 and is available from Indie Art & Design. Budding masterchefs will adore a kitchen to bang and clang pint sized pots in we’re sure! 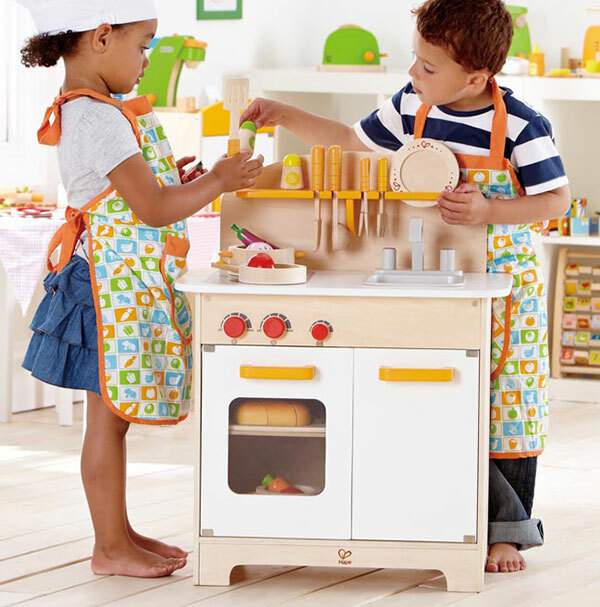 Hape Toys has awesome new play kitchen furniture available in time for Christmas, including this chef worthy Gourmet Chef Kitchen. The kitchen set includes an oven with opening door, knobs that turn, cooktop and storage hutch – all of this plus the kitchen sink! Hape Gourmet Chef Kitchen is a great investment at $160 from Bunyip Toys. 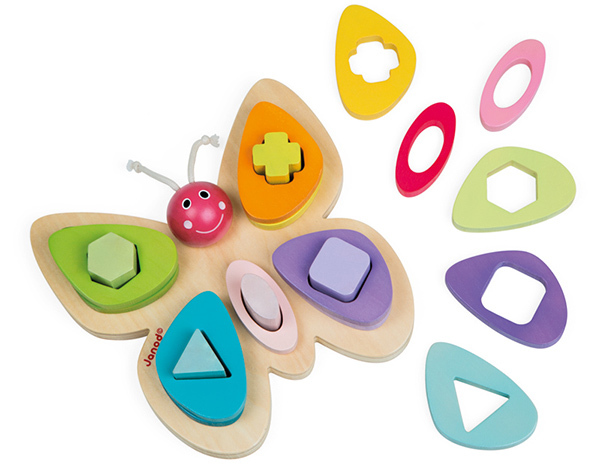 French brand Janod always win me over with their beautiful wooden toys to suit all budgets, but I especially adore this new take on a shape sorter, the Butterfly Stacking Puzzle. 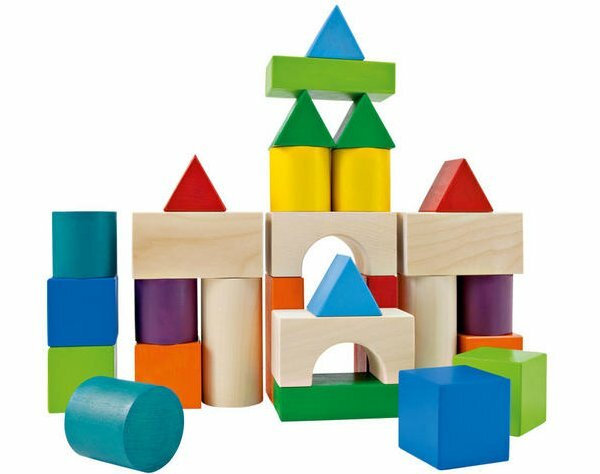 Gorgeous to look at, little ones will love learning their shapes and which coloured wooden pieces fit where, plus of course stacking them over and over and over again! Priced $42.95, you can find fluttery Janod beauty at Lime Tree Kids. The Mocka Moova is the ultimate ride for any doll or ted. Available in red, pink and black with white spots, it’s sure to be a hit for transporting a crowd of soft friends or a whole stack of blocks. 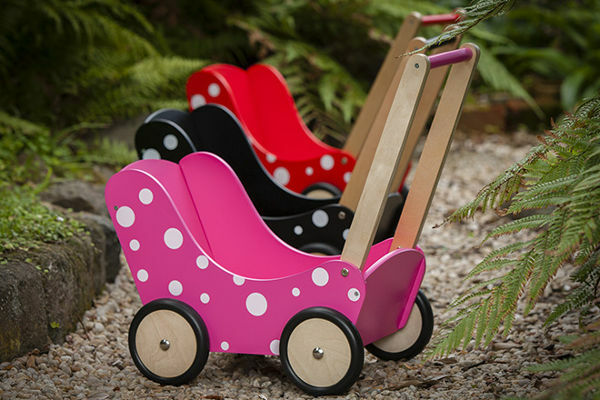 Made from durable MDF, thanks to the low height handle it’s suitable for children aged one and over. Mocka Moova is priced $59.95 and available direct from Mocka. Wooden blocks are one of those toys that keep on giving, and are just as much fun for babies as for big kids. They deserve a place under every tree, especially when they’re as funky as this set of Selecta Wooden Building Blocks. A mix of both natural and brightly painted blocks, small hands will love getting busy building the tallest of towers on Christmas Day! The 28 block set can be purchased from Honeybee Toys. 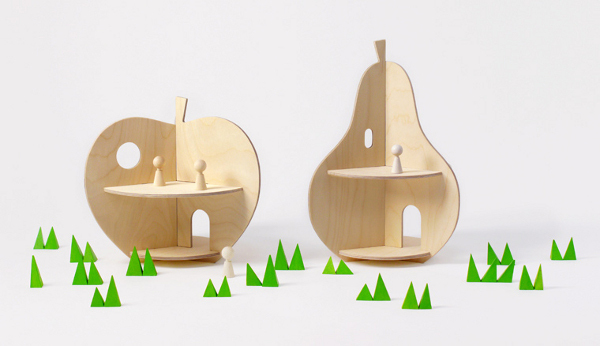 Doll houses are always a popular choice and we love the modern aesthetic of the Rock and Pebble Apple and Pear Houses. Completely open, they make it really easy for children to come together from any angle to play at these fruit shaped birch gems. Petite in size, they make a great decorative piece when it’s time to pack the toys away. Priced $149 each, Rock and Pebble houses are available locally from Kidostore. Do the kids need a place to call their own? 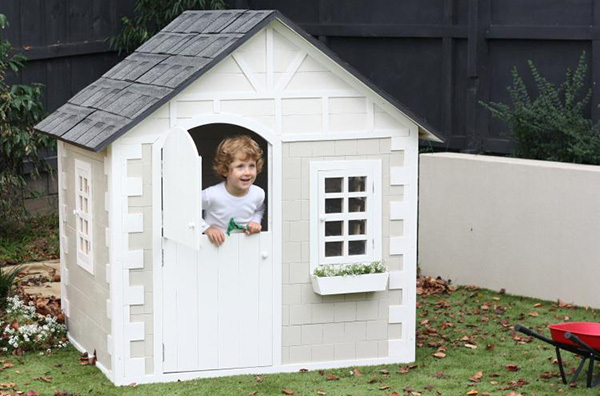 Send them into the fresh air of the backyard with one of the amazing cubby houses from Hip Kids. Looking like it came straight from a fairy tale, the Tudor style Mini Alice Cubby (priced $679) is the perfect size for a small space. It comes complete with perspex windows, shingled roof and you can paint it whatever colours you fancy. You can order yours directly from Hip Kids. Stacking toys are always popular with young children and Grimms Stacking Rainbow toy never fails to have children and adults alike fawning over its multi coloured beauty. 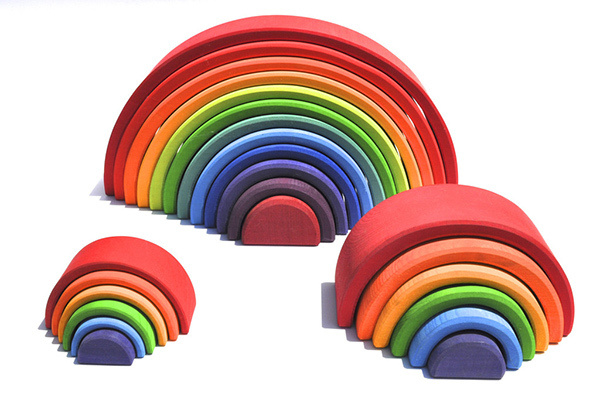 A Babyology favourite, Grimms Rainbow is available in small ($25), medium ($45) and large ($120) sizes for small to big fun! All three sizes are available at Village Toys.